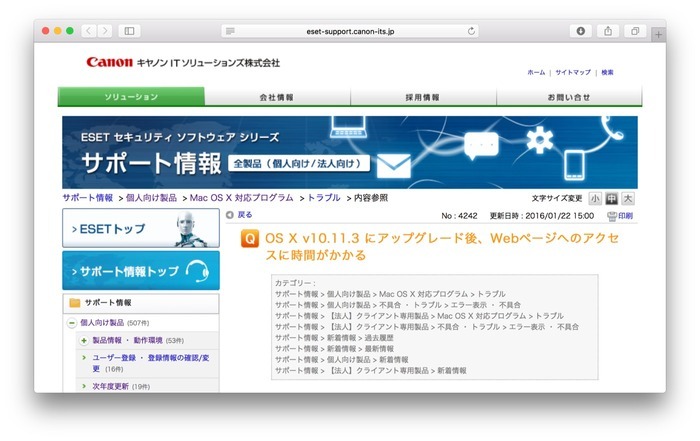 ESET、ESET Cyber SecurityをインストールしたMacをOS X 10.11.3へアップデートするとWebページの表示が遅くなる不具合に対し修正モジュールを提供。 | AAPL Ch. Some users are experiencing slow or no Internet connections after upgrading to OS X 10.11.3 with ESET Cyber Security or ESET Cyber Security Pro. ​No further action is required. Your ESET product will update automatically to the latest IPM and this will resolve the issue.